Because a memory can be deliberately recalled or consciously evoked, the psychological concept of remembering has come to be regarded as a special function of the brain. But there is another way to look at it: all of our behaviours can be regarded as involving an act of remembering. The voluntary recollection of an abstract concept would then be only a particular case of this very general process, a phenomenon related to what we call consciousness. The more we think about a piece of information that we want to remember and its relations to other concepts that we already know, the less chance there is that we will forget it. This may be why forgetting is associated more with episodic memory than with semantic memory. It is probably easier to draw connections between the meaning of a new word and our network of existing knowledge than to draw such connections for any particular episode in our lives. More generally, the less any given fact is integrated with our overall personality and activities, the faster we will forget it. We quickly forget anything that is not supported by a motivation and does not lead to an action. Various theories have been developed with regard to forgetting. They deal with the process of memorization or the processing of information. Like any biological process, memory deteriorates and becomes more fragmented over time. According to the decline theory, forgetting occurs when the memory is not exercised or the information in question is not retrieved often enough. This is confirmed by statistics on the words that people forget in a language. Proper nouns, which are used less often, disappear first. Next come common nouns, then adjectives (which are used more often, because they can modify many nouns), then verbs, and then, lastly, exclamations and interjections. Forgetting is a disturbance in the retrieval of information, not in its storage. According to the defective-recall theory, if you are momentarily unable to access a piece of information in your memory, the reason is insufficient encoding, or a lack of relationship to your existing semantic knowledge, or inappropriate retrieval indexes. But the stored information still exists somewhere in your memory, because at some other time, you might suddenly be able to access it. According to this theory, there are unconscious mechanisms that make us forget unpleasant or painful facts. Indeed, psychoanalysts have shown that forgetting is often associated with events that have disagreeable or stressful connotations. Freud postulated a selective process by which people reject, or suppress in their unconscious, certain memories associated with past traumas that would be unbearable to remember. Psychoanalysis is based on the idea that such suppressed memories have not really been forgotten and can be brought back to patients’ conscious awareness. According to interference theory, a piece of information is forgotten because some other piece of information prevents it from being retrieved. In retroactive interference, new memories tend to erase older ones. Conversely, in proactive interference, older memories prevent new facts from being committed to memory effectively. Thus, together, retroactive and proactive interference enable us to update our knowledge of the world. New information can overwrite some of the older information in our memories, through retroaction, but not all of it, because proaction prevents it. Some forms of amnesia are highly specialized and affect only a limited aspect of memory. One very curious example is the condition known as prosopagnosia. This rare form of amnesia prevents its victims from recognizing people’s faces. Whether they see these faces live or in photos, and even if the faces are those of co-workers or family members (or even, in the most severe cases, their own faces! ), they do not know whom they are looking at. But this can change if a person whom they are looking at speaks. Often, people with prosopagnosia can recognize someone’s voice and silhouette, and the rest of their memory functions normally. This deficit piqued certain researchers’ curiosity. They investigated, and learned that certain neurons in the human brain react only when we see faces, and not when we see other objects. The researchers explained this very high degree of specialization as follows. 1) The ability to recognize individuals is very important in social species such as humans, and humans recognize other humans mainly by their faces. 2) All faces are constructed according to the same pattern. They differ only in very slight details, which is why specialized neurons have developed to recognize such details. Amnesias can be divided into two categories: neurological amnesias (originating from organic lesions) and psychogenic amnesias (arising from psychic traumas). In both categories, a number of different syndromes have been clearly identified. Here are some examples. Alzheimer’s disease strikes later in life and is characterized by degeneration of certain neurons in the brain. Memory problems are one of the first warning signs of this illness. This is what makes Alzheimer’s so hard to diagnose early. As people get older, many of them start to experience minor memory losses as a normal phenomenon associated with aging. But for people with Alzheimer’s, over a few years, all of the various forms of memory fall apart. Episodic memory (memory of events in their own lives) is first to go. Next comes short-term memory, then memory of the meanings of words, and then procedural (“how-to”) memory. In the end, all reasoning, attention, and language abilities are disrupted. Korsakoff’s syndrome is caused by chronic alcoholism (possibly because it induces a vitamin B1 deficiency). The brain damage caused by this syndrome leads to progressively worsening anterograde amnesia. It may also be accompanied by retrograde amnesia, in which the newer memories disappear first. People with Korsakoff’s are often totally unaware of it, and answer questions by confabulating, with a sort of euphoria that also leads to false memories. But the essential characteristic is still anterograde amnesia, where immediate memory is preserved, but permanent new memories cannot be established. Amnesic ictuses are short amnesic episodes that occur suddenly and last just a few hours. Their causes are poorly understood. In people who are over 50 years old but in good health otherwise, the average ictus lasts six to ten hours and is not accompanied by any permanent brain damage. But during these episodes, people suffer from major anterograde amnesia, almost instantaneously forgetting everything that has just happened. In addition, they may experience retrograde amnesia covering several decades of their lives. The most common form of psychogenic amnesia is that associated with a violent experience, such as being mugged or raped. This form of psychogenic amnesia is often accompanied by a fugue state arising after an encounter that involves an emotional shock. The police often pick up people in such states who cannot even remember their names and addresses. These people lose their biographical memories, but preserve their semantic and procedural memories. Their episodes of amnesia can last from a few hours to several days, or sometimes even months. Such cases are rare, however, though they are often heavily reported in the media. Multiple personality disorder, in which two or more personalities give the impression of co-existing in the same body, also involves a significant memory disturbance. Each of these personalities seems to have no access to the memories stored by the others. This form of amnesia chiefly affects biographical memories, leaving semantic and procedural memory accessible to all of the person’s identities. This disorder is believed to develop as a defence mechanism against childhood deprivation or abuse. After a head injury at age 9, patient H.M. suffered from epileptic attacks that did not respond to the medications available at the time. In 1953, at age 27, he underwent an operation to remove the parts of his brain that were causing the attacks: the two medial temporal lobes of his cortex (in other words, the hippocampus and surrounding areas on both sides of his brain). The attacks ceased, but the operation resulted in severe anterograde amnesia that prevented him from learning any new facts from then on. Patient H.M. described his own state as a kind of waking dream. He retained all of his intelligence and the memories of his distant past. But he no longer recognized the doctor who had been treating him for years, he would read the same magazines over and over, and so on. Anterograde amnesia, also known as fixation amnesia, is the inability to remember or recognize new information or new events that occurred after the amnesia’s onset. Retrograde amnesia, also known as evocation amnesia, is the inability to remember or recognize information or events that occurred prior to onset. The famous patient H.M., for example (see sidebar), was found to have severe anterograde amnesia together with less severe retrograde amnesia covering the two years preceding his brain surgery. This inability to store new long-term memories literally froze his personal history and knowledge at the point where they were at the time of his operation. For example, after his operation, H.M. could no longer recall a list of words a few minutes after hearing it. He also had difficulty with new words that were entering the language at the time, such as “jacuzzi” and “granola”. And yet his short-term memory and implicit memory, as well as his memories of the distant past, were intact. For example, he could acquire and master new skills, such as tracking a target or copying an object in a mirror, even though he could not remember having practiced these skills many times in order to do so. This separation of his declarative memory from his other forms of memory contributed greatly to the identification of the major categories of memory that are recognized today. The Hanoi Towers Problem: one of the tests used to assess H.M.’s cognitive abilities after the operation that caused his amnesia. 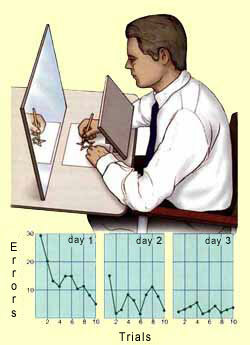 In both of these tests, H.M. improved his skills over the course of several days, even though each time he took these tests, he thought that he was doing so for the first time. This shows that despite his amnesia, he could still acquire certain procedural memories.